Chris Maragos (born January 6, 1987) is an American football safety and special teamer for the Philadelphia Eagles of the National Football League (NFL). He was signed by the San Francisco 49ers as an undrafted free agent in 2010. He has also played for the Seattle Seahawks. He played college football at Western Michigan before transferring to Wisconsin. Maragos was a football and track star for three years at Park High School in Racine, Wisconsin. During his junior year in 2003, Maragos started at wide receiver for Park's varsity team. After securing a playoff berth, Park was eliminated in the first round of the playoffs by eventual state championship runner-up Arrowhead. During the off-season, Park's longtime head coach retired, leading to a changing of the guard in the football program. Citing philosophical differences with the new regime, Maragos transferred to Racine's Horlick High School, which featured a pass-happy spread offense and emerging quarterback talent Justin Kammler. Maragos's first game as a Horlick Rebel was a road contest against his former school in August 2004. The rivalry game quickly became a lopsided affair, as Maragos dominated his former team with nine catches, 115 yards receiving, and a touchdown en route to a 29-6 victory. According to Rebels coach George Machado, Maragos was heaped with verbal abuse during the game but "he maintained himself with class." Maragos continued his torrid stretch in the first four games of his senior season, recording 27 catches for 359 yards and two touchdowns. During this time, Machado called Maragos "one of the best [football players] to play here" and "a gentleman, [and] a good student, [who] comes from a strong family. He is a very strong positive influence on this football team." His statistics and the Rebels' offensive production dipped when Kammler was sidelined with an injury. But Maragos made a statement with his talent, being named Horlick Player of the Year and first-team All-Racine County, All-Southeast Conference, and All-Region. As he weighed his collegiate options, Maragos eventually chose to attend Western Michigan, a school already home to future NFL Pro Bowl receiver Greg Jennings. Maragos redshirted at Western Michigan in 2005, where he played as a wide receiver. Upon arrival at the school, the first player to introduce himself to Maragos was senior wide receiver Greg Jennings. Jennings became somewhat of a mentor to Maragos, teaching him the intricacies of excelling as a collegiate wide receiver and giving him rides to church on Sundays. Maragos was inspired by the star player's dedication to his craft, saying "he would always be first in the meetings, front row, pen out, ready to learn, ready to do things." After starting eight games at wide receiver for Western Michigan during the 2006 season, Maragos transferred to Wisconsin and sat out a year (due to NCAA transfer rules) before resuming play in 2008. During this time, Maragos was converted to defense, where he became a standout free safety. In two years with the Badgers he recorded five interceptions and 94 tackles. Maragos had six passes defensed in his 2009 senior season, including one that helped end a comeback attempt by Northern Illinois and secure a 28-20 Badger victory. He was also Wisconsin's placekicking holder for extra points and field goals. During a 2009 road game against Ohio State, he scored a touchdown at that position on a fake field goal attempt. Maragos was undrafted in the 2010 NFL Draft. He signed with the San Francisco 49ers on April 26, 2010. Maragos entered 2010 training camp for a 49ers club trying to build on a promising 2009 campaign. On August 22, Maragos appeared in a nationally-televised game against the Minnesota Vikings on NBC's "Sunday Night Football." The program achieved the highest ratings for a Week Two preseason game in seven years, as it featured the heavily-publicized return of Brett Favre for a 20th and final NFL season. Despite a training camp performance that garnered favorable reviews from local beat reporters, Maragos was released by the 49ers on September 3. On September 5, Maragos was added to the 49ers' practice squad, where he spent the first part of the 2010 season. On October 18, Maragos was added to the 49ers' active roster for a game in Charlotte against the Carolina Panthers, though he did not play in the contest. The following week, on October 28, Maragos and the team flew across the world to London for a game against the Denver Broncos. Upon arrival, Maragos was informed that he had been released from the 49ers. The rare timing of the release gained widespread attention when ESPN reporter Adam Schefter tweeted about the oddity. Fortunately, Maragos was signed to the practice squad and able to remain with the team in London, instead of being forced to fly back home immediately. He again joined the San Francisco active roster on November 30, and made his NFL playing debut at Lambeau Field on December 5, facing the team from his home state, the Green Bay Packers. During that game he recorded his first NFL career tackle against the eventual Super Bowl XLV champions. After the 2010 season, the 49ers fired head coach Mike Singletary and replaced him with Stanford head coach Jim Harbaugh. The coaching shakeup led to an influx of new safeties, which resulted in greater competition for a roster spot. Consequently, Maragos saw his tenure with the 49ers come to end as he was released on September 3, 2011. Maragos was signed to the Seattle Seahawks' practice squad on September 22, 2011. Seattle was rebuilding its roster, and head coach Pete Carroll and general manager John Schneider were impressed with Maragos's apparent work ethic and character. The Seahawks promoted him to the active roster on October 22, a spot he has maintained on the team since. After a rough start to the 2011 season, Seattle finished the year with a 7-9 record. In 2012, the Seahawks became a legitimate Super Bowl contender, going 11-5 and winning a road playoff game against the Washington Redskins. 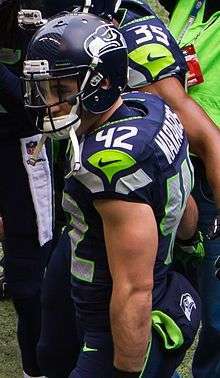 During his stint with the Seahawks, Maragos has routinely been awarded the team honor for "Special Teams Player of the Week." On April 11, 2013 Maragos signed a one-year contract with the Seahawks for $1.32 million. After reaching the agreement, Maragos expressed gratitude to the franchise. “It’s phenomenal. Just to be in a position like this is humbling and I’m truly fortunate to be a part of such a great organization. To continue my career as a Seahawk, I couldn’t be any happier.” On September 6, 2013 Margos accepted a pay cut to $855,000 to remain a Seahawk. In 2013, the Seahawks secured the top playoff seed in the NFC with a conference-best 13-3 record. After a bye week, Seattle defeated the New Orleans Saints in the playoffs. The Seahawks then beat the San Francisco 49ers in the NFC Championship Game to advance to Super Bowl XLVIII. On February 2, 2014, Maragos and the Seahawks defeated the Denver Broncos 43-8 in the third-most lopsided Super Bowl in history. It was the most-watched program in the history of American television. On March 12, 2014, Maragos signed a 3-year, $4 million contract with the Philadelphia Eagles. On December 6, 2015, his blocked punt was returned for a touchdown in Philadelphia's 35-28 win over the New England Patriots. On November 17, 2016, Maragos signed a three-year, $6 million contract extension with $2.45 million guaranteed through the 2019 season. Maragos is a Christian. He has spoken about his faith in God, saying, "He's the Alpha, He's the Omega. He's the beginning and end of everything. To understand where we've reached [as pro football players], which is in the world's view quote-unquote 'the pinnacle,' you really see how empty that is. Having Jesus in my life, you really see how important that is because you see that He is everything. To take Jesus, who is perfect, and to be so humble as to come to earth as a mere man and to live the life that He lived despite knowing my sin, to go on the cross and to die for my sin and our sin and everyone's sin – to me, that's everything. That's joy, that's peace, that's love to think that He and His perfection would do that despite knowing really the depths of who I am." Chris's brother Troy is the Pastor of Student Ministries at the Niles campus of Harvest Bible Chapel. Chris married Serah (née West) on April 9, 2010. They are parents to two children, Micah (born 2011) and Mason (born 2014). ↑ Jackel, Pete (2004-08-28). "Kammler cashes in for Rebels : Sports". Journaltimes.com. Retrieved 2014-02-03. 1 2 Feldmann, Mark (2004-09-23). "Focus on Football: Maragos' arrival strengthens already strong Horlick receiving corps : Sports". Journaltimes.com. Retrieved 2014-02-03. ↑ Jackel, Pete (2005-05-26). "Maragos ready for challenge : Sports". Journaltimes.com. Retrieved 2014-02-03. ↑ Jackel, Peter (2006-10-16). "Maragos following Jennings' path : Sports". Journaltimes.com. Retrieved 2014-02-03. ↑ Markeyblade, Matt. "Unusual victory: Ohio State struggles on offense, still wins". Toledo Blade. Retrieved 2014-02-03. ↑ "'Sunday Night Football' Vikings-49ers Matches Best NFL Preseason Week 2 Overnight In 7 Years - Ratings | TVbytheNumbers". Tvbythenumbers.zap2it.com. Retrieved 2014-02-03. ↑ "Twitter / AdamSchefter: 49ers re-signed S Chris Maragos". Twitter.com. 2010-10-28. Retrieved 2014-02-03. ↑ Price, Taylor. "49ers Trim Roster to 53". 49ers.com. Retrieved 2014-02-03. ↑ "Maragos, Seahawks agree on contract : Football". Journaltimes.com. 2013-04-11. Retrieved 2014-02-03. ↑ "Eagles agree to terms with former Seahawks safety Chris Maragos : Football". phillytimes.com. 2014-03-12. Retrieved 2014-03-12. ↑ Smith, Alex (November 17, 2016). "Maragos Agrees To New Three-Year Deal". PhiladelphiaEagles.com. ↑ "Seattle Seahawks' Russell Wilson, Players Agree With Assistant Coach: 'Jesus Is Better Than Super Bowl'". ↑ "Troy Maragos". Harvest Bible Chapel. Retrieved 2014-02-03. ↑ Jackel, Peter (July 30, 2016). "Passionate Maragos makes running jump into season". JournalTimes.com. Racine Journal Times. Retrieved September 28, 2016.